Hump day here at 80sObscurities and I’m hoping that today’s selection will crank things up and get us closer to the weekend, faster. 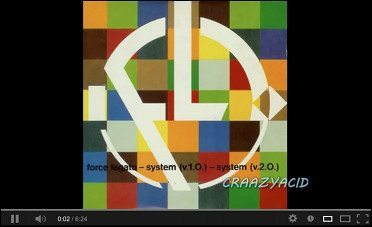 Force Legato only ever released one song, 1989’s “System”, but that doesn’t mean they didn’t leave their mark. This 12” has the distinction of being the first record released by legendary Frankfurt DJ/producer Oliver Lieb. Not only that, but it’s also notable for the fact that Lieb’s partner in the project was none other than equally legendary German producer and Dorian Gray night club resident DJ Torsten Fenslau (R.I.P.). “System” was an audio documentation of the shift occurring in electronic music at the turn of the decade, where the “traditional” EBM and industrial beats that had dominated dance floors were beginning to morph into new styles and sounds. New Beat was already coming to fashion and it wouldn’t be long before techno would totally take over. This track, however, has one foot firmly in both camps, which might explain why it resonated so well with so many and nearly hit the official German pop charts at the time. Lieb would go on to achieve international acclaim for his trance projects LSG and Paragliders and today has over 250 production credits to his name. Fenslau, for his part, was even more successful in a sense. While outside of the Frankfurt scene he might not have gotten the same name recognition as Lieb, his “group” Culture Beat (really Fenslau and production partner Peter Zweier, with guest vocalists Tania Evans and Jay Supreme) topped charts around the globe with their 1993 hit “Mr. Vain.” Sadly, Fenslau would be killed in a car accident later that year, but Oliver Lieb continues to be a major presence in electronic music. The more you know… from 80sObs.